Taipei, March 26 (CNA) An international workshop on anti-corruption organized under the Taiwan-U.S. Global Cooperation and Training Framework (GCTF) kicked off Tuesday in Taipei, with Japan joining as a co-host for the first time. "We are delighted that, for the first time, we have Japan joining us to co-host this particular workshop. Japan's involvement brings with it the resources to address even more issues of common concern for the region," Deputy Foreign Minister Hsu Szu-chien (徐斯儉) said at the opening ceremony for the International Training Workshop on Anti-Corruption in Public and Private Sectors. In his speech, Japan's top envoy to Taiwan Mikio Numata said he was delighted to co-host the event that he said has served as an effective platform for tackling corruption in the Indo-Pacific region. Numata said the U.S., Japan and other countries around the globe are beginning to recognize Taiwan as an important partner in the region and international community. "We are delighted to devote the utmost effort to contribute to the framework," he said, expressing hope that the workshop would promote practical cooperation and serve as a vehicle for sharing Japan's knowledge and experience on common agendas. After giving his speech, Numata told reporters that he first heard of the U.S-Taiwan project from the American Institute in Taiwan (AIT) back in 2014. 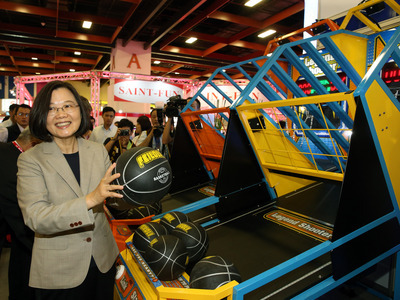 The AIT represents U.S. interests in Taiwan in the absence of diplomatic ties. Since the official launch of the GCTF in 2015, he has been pushing for Japan to co-host workshops under the Taiwan-U.S. framework. Though it took some time, he said he was delighted to see Japan finally able to co-host a GCFT workshop in Taiwan, calling it "a historic day." Meanwhile, in his address, AIT Director Brent Christensen said this GCTF was the perfect event to showcase U.S.-Taiwan shared values. "We are extremely fortunate to have a regional leader in Taiwan -- a mature democracy not only dedicated to countering corruption, but willing to share its expertise with partners to make the Indo-Pacific region more resistant to the dangers of corruption," he said. "This workshop is a clear manifestation of that leadership, bolstered by the expertise of trainers from Japan, Malaysia, and the U.S. Department of Justice and Federal Bureau of Investigation," he added. The two-day-workshop organized by Taiwan's Ministry of Justice's Investigation Bureau, the first GCTF event of the year, is being attended by 24 participants from 17 countries in the region. Since its establishment in 2015, more than 300 policymakers and experts from around the world have participated in 15 international training programs. These events have covered such issues as public health, law enforcement, media literacy, women's empowerment, and energy security, according to Taiwan's foreign ministry. The two-day workshop in Taipei will feature a speech on global anti-corruption trends by U.S. Department of Justice official Robert Heberle and a speech by Junichiro Otani, a Japanese professor who specializes in East Asian anti-corruption efforts. Mohd Hafaz bin Nazar, director of the Financial Analysis Division of the Malaysian Anti-Corruption Commission (MACC), will also talk about his experience in investigating the 1MDB scandal.